You've likely heard that garlic has health benefits, including the ability to lower cholesterol and reduce high blood pressure. What you may not know is that how garlic is prepared matters. Raw garlic is the best source of the antioxidants responsible for the vegetable's health benefits. However, raw garlic can also cause digestive problems, including bloating, for some people. If you have an intolerance or allergy to garlic, eating raw garlic may cause a range of symptoms, including digestive ailments such as bloating. Excessive gas produced in the digestive tract can make you feel bloated, have painful cramps and experience flatulence. Diarrhea, vomiting and nausea may also occur with a garlic allergy, as well as an itchy rash, eczema and wheezing. You may be able to tolerate small amounts of raw garlic but notice that your symptoms appear with increased consumption. An article published in "American Family Physician" in July 2005 noted that eating raw garlic on an empty stomach is particularly likely to cause irritation to the digestive tract. Other symptoms that can result from eating too much raw garlic include vomiting and stomach pain. Your bloating may be accompanied by flatulence. The "American Family Physician" article noted that garlic's health benefits are due to its high concentration of sulfur-containing compounds called thiosulfinates. These same compounds are also what give flatus its foul-smelling odor. Cooking garlic deactivates some of the compounds, which means that eating raw garlic may make you particularly susceptible to embarrassing gas. 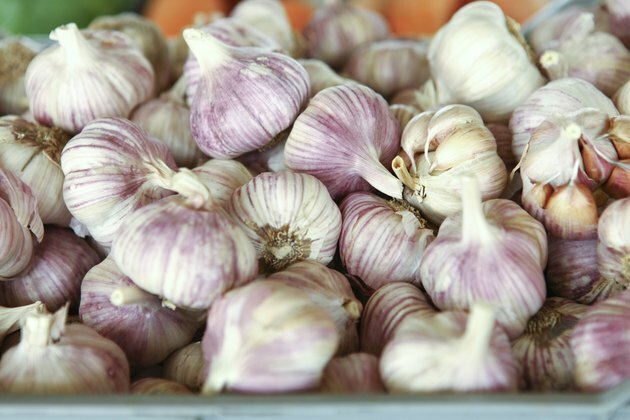 If you have an allergy or intolerance to garlic, avoiding it altogether is your best bet. Allergies can be life-threatening, so be sure to tell your doctor if you suspect you have one. You can also try eating cooked instead of raw garlic to see if that reduces your symptoms. Just keep in mind that cooking or drying garlic destroys its active compounds, such as thiosulfinates, and thus some of its health benefits. Monitor your intake of raw garlic and avoid eating excessive amounts at one time, especially if you have digestive problems. Why Does Garlic Make My Stomach Hurt?